Modern arthropods are the most abundant living eukaryotes, both in numbers and varieties. It is no surprise that arthropod fossils are also among the most abundant fossils on earth. The large variety of organisms within the phylum are characterized by jointed (arthro) appendages (arms or legs), and a hard exoskeleton of chitin. In this image are representatives of two arthropod groups. On the left is the arthropod Balanus, the barnacle. Barnacles (Subphylum Crustacea, Class Maxillopoda. Order Thoracica) are first found as fossils in Silurian rocks, and range to Recent. They are abundant in some upper Tertiary rocks, where they sometimes occur in layers composed almost entirely of barnacles. On the right is a crab Archaeogeryon. Crabs are also crustaceans (Class Malacostraca, Order Decapoda). Members of this group first occur in rocks of the Permotriassic. They are found frequently in coastal sediments of the upper Tertiary. Shown on the left is Mesolimulus, a fossil representative of the modern horseshoe crab (Limulus). Horseshoe crabs are in Subphylum Chelicerata, along with the modern (and fossil) spiders. The horseshoe crabs are in Class Merostomata, Order Limulida. They are first found as fossils in Devonian rocks. The modern forms are hardly distinguishable from the fossils. 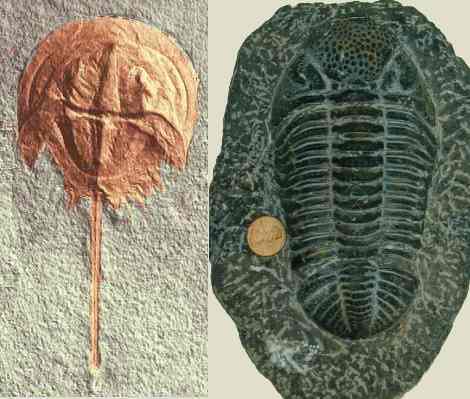 On the right is a representative of perhaps the most famous of all fossil arthropods, the trilobite. Shown is Phacops africanus, a species from north Africa's Atlas Mountains. Trilobites are first found in Lower Cambrian rocks. They are very common as fossils in Cambrian and Ordovician rocks, becoming less abundant upward to the Permian where the last fossils occur. For more on trilobites see the section devoted to them.